RIO DE JANEIRO, Dec 2 2011 (IPS) - Nearly a month after the start of the offshore oil spill, authorities in Brazil have not yet been able to determine the causes of the accident, how much oil was leaked at a Chevron platform, the size of the oil slick, or the extent of the environmental damage. In the midst of contradictory and scarce information, fears over the environmental risks posed by the technologically-challenging exploitation of the country’s massive “pre-salt” oil reserves – buried under thick layers of sand, rock and salt – are growing. The most alarming warning inadvertently came from the U.S.-based Chevron itself, which operates the well where the accident occurred, at a depth of 1,200 metres in the Frade field, 370 km off the coast of Rio de Janeiro. The president of Chevron for Africa and Latin America, Ali Moshiri, told the press that “we are dealing with Mother Nature, and she is complicated,” the Agência Brasil government news agency reported. But Leandra Gonçalves with the climate and energy campaign of environmental watchdog Greenpeace said reports about what happened “have been contradictory and confusing. The disaster area is rich in fish and marine mammals and the full impact will only be seen over the course of the next few months, according to Greenpeace's Leandra Gonçalves. "In addition, the contaminated phytoplankton and zooplankton that are eaten by larger prey could spread the toxicity to other areas," she said. The accident occurred just when the Brazilian Congress is debating a new distribution of oil revenue, which would reduce the profits of producer states like Rio de Janeiro. "This is a clear demonstration of what kinds of environmental damages a producer state faces," argued Rio de Janeiro Governor Sergio Cabral. But despite the risks, federal and provincial authorities staunchly defend exploration and drilling in the pre-salt reserves, which may make Brazil a leading oil producer. “The U.S. company and the Brazilian government have dealt with the situation with a great lack of transparency,” she told IPS. According to the government of Dilma Rousseff, the “geological complexity” of the deep-sea deposit could have contributed to the accident. Chevron, which publicly apologised for the spill, has been fined 28 million dollars and has been banned from operating in Brazil. The question is how much more “complicated” Mother Nature will be when efforts are made to extract oil from a depth of seven kilometres, under thick layers of salt. The deposits, considered “the new frontier” of oil exploration in Brazil, pose huge technological challenges and risks. After the pre-salt deposits were discovered a few years ago, Brazil’s proven reserves climbed from 14 billion barrels to 33 billion barrels, to which between 50 and 100 billion barrels of possible and probable reserves have to be added. The accident on the platform operated by Chevron sounded “a red alert” with respect to future work in the pre-salt reserves, Rio de Janeiro state environment secretary Carlos Minc told foreign correspondents. “We will have to focus more on prevention, study the situation more carefully, be more rigorous, and fight impunity for environmental crimes,” he said. The specific causes of the leak, which began on Nov. 7, have not been fully explained. Chevron said that while drilling a well, workers encountered unexpected oil pressure, and oil started seeping through cracks in the rock. But the federal police suspect that Chevron was drilling deeper than what it was authorised to do. Nor is it clear how much oil leaked. The company initially said 400 to 650 barrels were lost, but later increased the total to 2,400 barrels. There are also differences with regard to estimates of the size of the oil slick. Brazil’s national oil regulator, ANP, says it is 163 square kilometres. 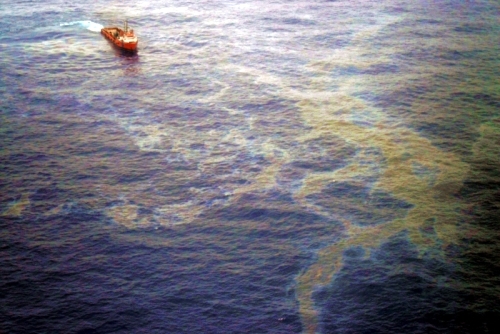 But John Amos, the head of SkyTruth, a U.S. environmental organisation that uses satellite images to track oil spills, said it could be 10 times that size. The attorney general’s office and federal police are investigating the accident – its causes as well as its environmental impact. Those found responsible could go to jail, and the initial fine of 28 million dollars may be increased. “This accident is an alert, not only for the current drilling activities but also for operations that will be carried out in the pre-salt deposits,” biologist Mario Moscatelli told IPS. “Companies may not be fully prepared to operate here, especially in the pre-salt reserves, but the authorities aren’t prepared to oversee them either, or to enforce the requirements established by law,” he said. “We are flying blind, and other accidents could follow this one,” he warned. More than 90 percent of the oil extracted in Brazil is from deep-water wells. As a result, the state oil company, Petrobrás – which holds a 30 percent stake in the Frade field, while Chevron holds a 51.7 percent interest – has become a leader in the development of deep-sea drilling technology. “It is essential for companies to be required to technically train and equip themselves, and for the authorities to be prepared as well, so they can prevent mishaps instead of showing up at disaster areas after the fact,” Moscatelli said. After the catastrophic oil spill in the Gulf of Mexico in 2010, when 4.9 million barrels of crude leaked into the sea, the Brazilian government and the ANP announced a raft of measures to step up safety on offshore platforms. But now the ANP is itself one of the focuses of the police and prosecutors’ investigation, to determine the flaws in oversight.